The La Trobe University Aspire Generation Work Studies unit supports students in Years 9 & 10 to consider volunteering and community service as a way to give back to their communities, while developing the skills and aptitudes required in work. It addresses the content descriptors of the Australian Curriculum: Work Studies. Learning activities in this resource are most suitable for use with Year 9 & 10 students, however can be amended and adapted for other year levels and subjects. Learning activities include student engagement with real-world information and learning stimuli, group work, visible thinking routines and use of ICT for investigation and demonstration of thinking and learning. The lesson activities support students to create artefacts for the purpose of formative and summative assessment. Students are required to engage in meaningful reflection at the conclusion of each lesson, and are encouraged to continue their thinking, scrutiny and application of the topics addressed throughout each lesson. The investigation and learning completed throughout the unit is applied to students’ local context through a scaffolded student-led social action project, wherein students choose a challenge faced by the local community, how they will take action and the manner in which they will present their learning for exhibition to a real audience. 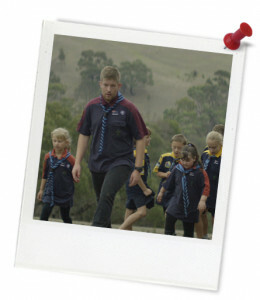 Students are encouraged to find and pursue volunteer and community service opportunities throughout the unit, and are guided to find out about La Trobe University’s Aspire Generation (for school-aged students) and the Aspire Program, a university admissions program, which considers volunteering and community engagement experience of all applicants – the Aspire Program is for people who’ve made a positive impact on their community – whether it’s through volunteering, leadership or community engagement. Access the Aspire Generation Work Studies unit here. 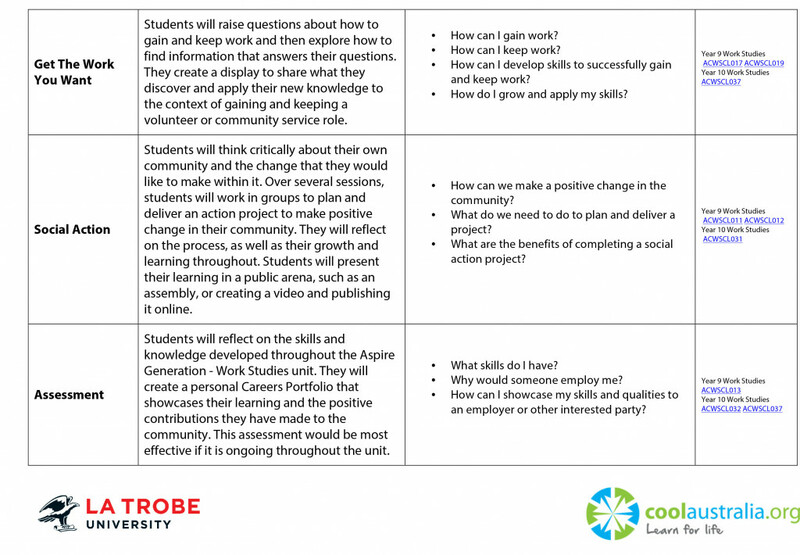 The La Trobe University Aspire Generation Work Studies unit addresses the content descriptors of the Australian Curriculum: Work Studies. The lessons in this can be taught as an entire sequential unit of study, or as individual lessons. The Aspire Generation is a community of young people connected by their aspiration to make a difference through community service and leadership. They are the givers, the dreamers, the doers and the leaders who passionately pursue opportunities to address the big issues of their time. They think boldly and act responsibly and strive to leave a lasting impact on the world. With our support, the Aspire Generation will be empowered to drive change through community engagement, volunteerism and leadership opportunities. The opportunities provided through the Aspire Generation program support the aspirations of young people ranging from Year 9 through to Year 12. Members of the Aspire Generation benefit from a range of volunteer and leadership opportunities, hosted by La Trobe in conjunction with various community organisations. Engage in service, leadership events and awards. High school students currently in Year 9, 10, 11 or 12 who have a passion for giving back, are eligible to be part of the Aspire Generation. 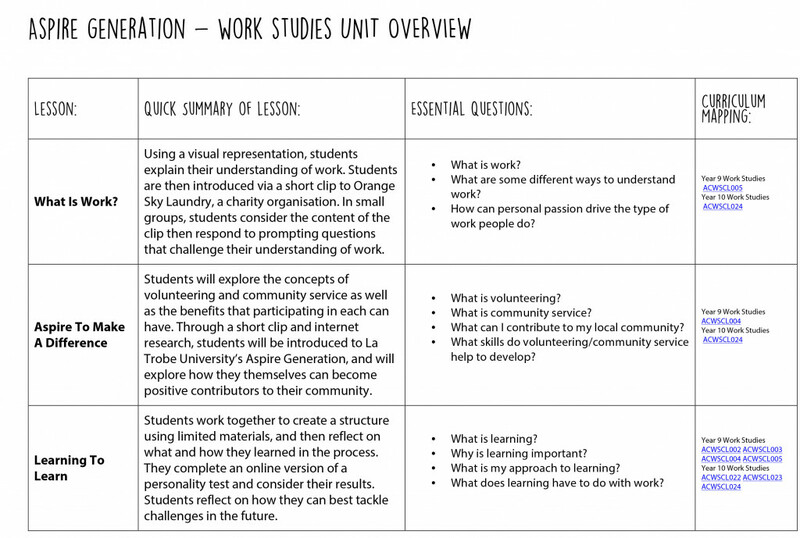 Click here to download a PDF version of the Aspire Generation - Work Studies - Unit Overview.